The elephant would not respond well to the sound of that machine gun a few inches from his ears. An American corporal aims a Colt M1895 atop a Sri Lankan elephant. The reason why the corporal is atop the elephant is a mystery but elephants were never a weapons platform adopted by the US Army. It’s probably a publicity picture, not something the army would actually try to employ. The elephant would not respond well to the sound of that machine gun a few inches from his ears. The gun is John Moses Browning’s M1895 Colt-Browning machine gun, nicknamed “Potato Digger”. The M1895 was developed by John Browning during the 1890s, it was a belt-fed, air-cooled, gas operated machine gun with a cyclic rate of 450 rounds per minute. As the weapon was air-cooled it did not require a water cooling system, as a result it was much lighter weighing just 17 kg (35 lbs). Gas pressure generated by ignited cartridges could be pulled from the barrel through a small opening leading into a cylinder. This force could provide an “automatic” mechanical action which drove a lever-action type arm. The movement of the arm required some eight inches of clearance at the underside of the weapon, lest the gun dig itself into the dirt. It was this action that gave rise to the weapon’s popular nickname of “Potato Digger”. The gun was moderately successful, but not outstanding. The elephants were used in war since ancients times, but with the advent of gunpowder warfare in 15th century the advantage for war elephants on the battlefield began to change. War elephants were usually deployed in the center of the line, where they could be useful to prevent a charge or to conduct one of their own. Their sheer size and their terrifying appearance made them valued heavy cavalry. Off the battlefield, they could carry heavy materiel and provided a useful means of transport before mechanized vehicles rendered them mostly obsolete. 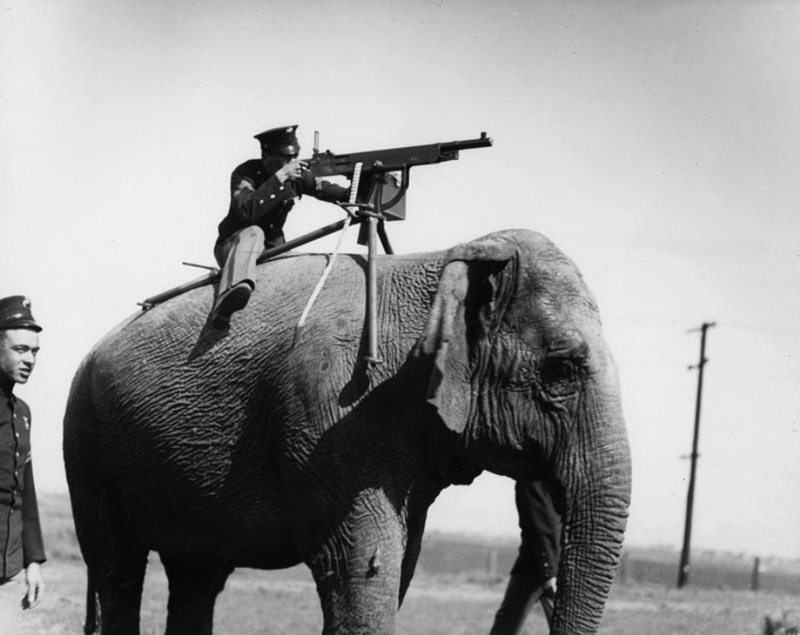 Into the 20th century, non-battle-trained elephants were used for other military purposes as late as World War II, particularly because the animals could perform tasks in regions that were problematic for modern vehicles. Even more problematic would have been the hundreds of red-hot spent cartridges cascading down the animal's ears, neck and legs, I should think. Hannibal would have been proud. Go get a Willys Jeep & mount your weaponry as it's supposed to be. Whoever thought this up was still living in 5th century times..